The examination for the Indian Coast will be conducted from April 12 to May 10, 2019. The examination will be conducted in Varanasi, Noida, Kolkata, Bhopal, and Jodhpur. The written examination will be of objective type, which will generally cover subjects such as Maths Physics, basic Chemistry knowledge of English upto 12th standard, general knowledge, current affairs, quantitative aptitude and reasoning etc. Short-listing criteria will be based on higher percentage of marks for a particular examination Centre. Those who qualify written examination will undergo Physical Fitness Test (PFT) and the testing procedure will take about two days. PFT will be conducted for all those who qualify the written tests. All candidates are advise d to be in possession of sport rig (Shoe, T -shirt, Trouser etc). Candidates who have filled up the examination form online from January 21 to 31, 2019, can now download their Indian Coast Guard hall ticket from the official website – joinindiancoastguard.gov.in. 1) Log on to the official Indian Coast Guard website – joinindiancoastguard.gov.in. 2) On the homepage, at the left top inder News Events the “link for printing e-admit card for navik (GD) 02/2019 batch admit card” is given. 4) Enter your registered email ID or Application No. and click on get details. 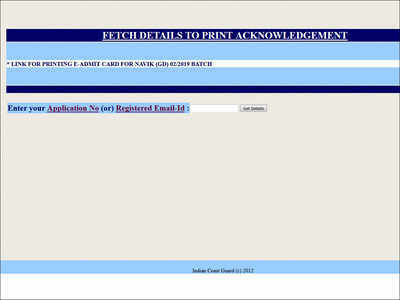 5) Your admit card will be available on your screen.